If you are passionate about living into life and leading with more of who you are, I made these cards for you! His words were inspiring the human being in us forward. It was his call for big change in the world through each individual acting within their human capacity to be more aware of their senses, to listen in instead of zoning out, to pause before rushing in, to respond from awareness rather than from impulse and reactivity, to be utterly courageous through being vulnerable. It was these qualities that he believed to be some of the most powerful forces for positive change on earth. He was a highly intelligent, creative human being who left a legacy fit for the rest of human history to come. Listening is one of the most powerfully transformative senses we have (but we are only utilising a fraction of its potential). Here are 53 invitations to play and stretch your thinking. They will make you stop, wonder, perhaps even confuse you for a second. They will put you in a new place where new ideas can come forward. They are doorways into your own creativity and capacity to Be the Change and not wait for someone else to. What a gift then you have in your hands; what a profound moment of choice of action you can initiate into your world and working world right now. They don’t talk about being the change, they offer you the chance to get on with it right now. They are a tool for you to step into action and shift old behaviour patterns, “stuckness”, or the forgone conclusions you feel are your working reality. With them you can lift your whole unworkable scenario to a higher plain where change can happen. And it all starts with you! 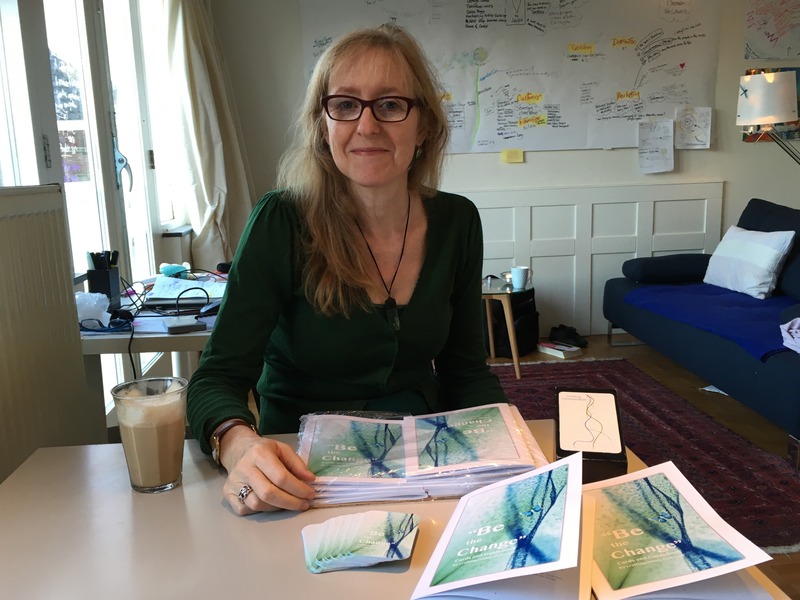 The images on the Be the Change Cards come from visual harvests of meetings, interviews and coaching sessions inspired by change-makers all over the world from India, Europe and across to San Francisco. They are not just drawings. Each one of them brings with it stories, journeys, and transformations of real people in organisations. The creations on the cards have previously passed through minds, hearts, souls, and hands to come into this space. So this process charges each card with an incredible power. How wonderful is it to think that the outcome of the journey of someone else can be the beginning of each of our own journeys. The cards and guidebook are a gift to you to be your own expert your own leader within each moment of every day. Shake off any judgement or struggle because this is different from anything else you’ve done before. Pick a card, jump in, and play! Notice what comes up in you. Perhaps it will trigger a feeling, an answer, an idea which you can bring into the group or just ponder on for a while. 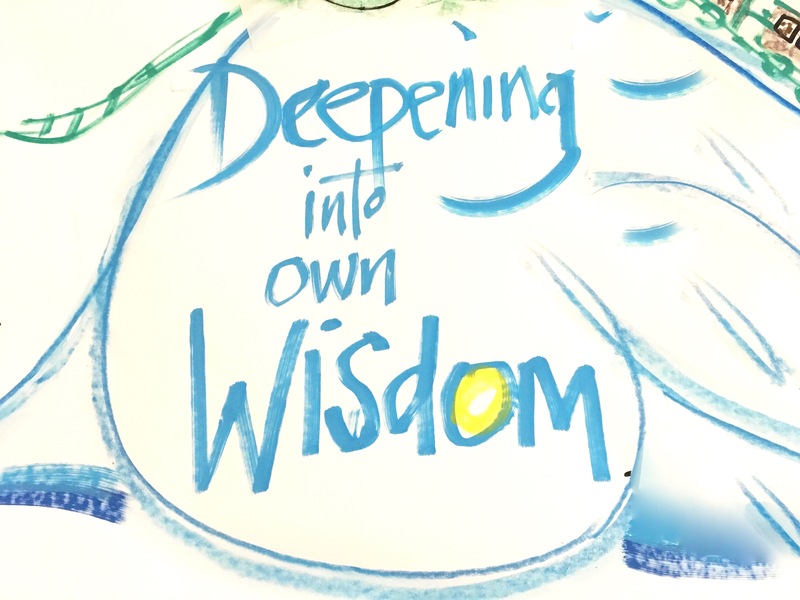 This is how you will join new dots and connect new thoughts, ideas, and feelings in a new way. So pick a card and start playing! Who Can Use the Cards and For What? They can be used in any working or domestic environment, for personal inquiries around decisions needing to be made, big or small; to facilitate and inspire deeper conversations during meetings, with clients, in classrooms. You can choose one or more cards with a question or situation in mind. 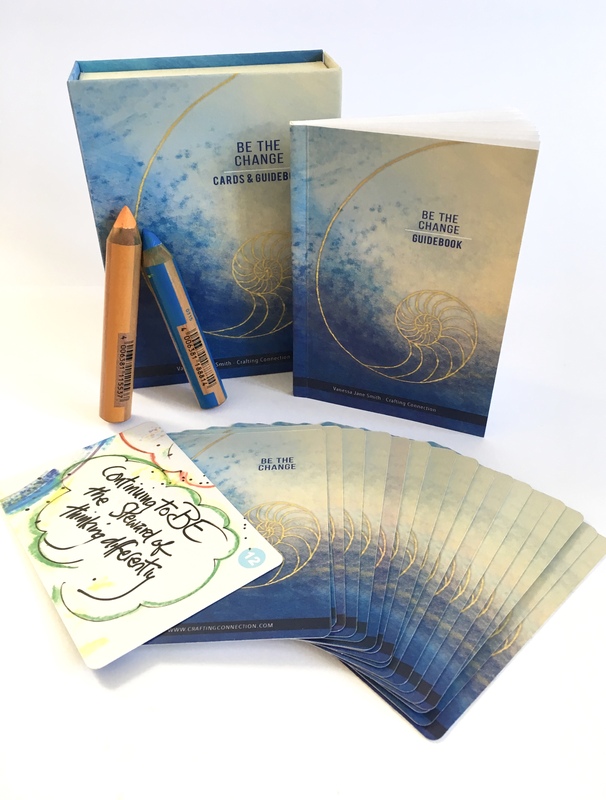 Once you’ve chosen a card(s) you can find a written reflection and specific questions related to each individual card in the Be the Change Guidebook. You can use the cards without the guidebook although I really recommend getting the guidebook as it will give you far more comprehensive insight and questions. What comes to mind as you pick this card? 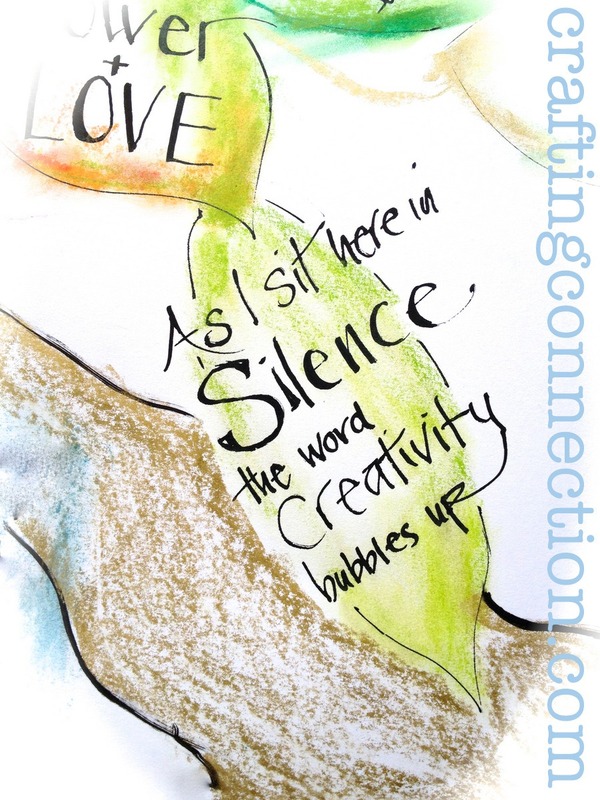 What might it be inviting you to create? What do you know to be true here? So fast-forwarding to today and welcome to my new tool Be the Change Cards and Guidebook. It’s been a long journey since my communications major at University in New Zealand in the 90’s. The thing was, communication had always felt fairly superficial to me. I always had the sense that there could be so much more (colour, depth, intuition, joy and life) in all of our everyday encounters. And I actually believe that people really, deeply want to express themselves so much more fully (and be heard doing it). We really do have so many more stories to tell and truths to unleash. And that when we do, magic happens, we are seen and heard and then some new light comes in and this longed for renewal take place. But how do you make a career of that? In my case I just kept at it, sometimes not having a clue about what would result. I guess the path to here has been more a case of listening and joining dots and following threads. There was no real strategy or plan but rather loads of feeling and purpose. The longer I stuck to the feeling and purpose and bigger picture, the more powerful the result. The cards you have here are one of the creative tools I use now with clients to help them cut to the essence, go in and retrieve the gold and make the shifts they so long for in their lives and the organisations they work in. Keep them at arms reach. Pick one to inspire you to think and act differently when faced with a challenge or an on-going issue in your working or private life. Let them inspire deeper, wider, more meaningful conversations and actions. For me, when we are really present in our working world and life, and when we each have the courage to step out from behind our stories, we transform them as well as transforming the world around us into a much better, more alive, living version. May your passion for life and bigger picture purpose shine through you. I sensed I was about to experience a life-changing moment. Everything until then had been leading to that moment and I knew I had to speak up or be silenced forever. If it had been my life at stake I would probably not have reacted so strongly, but it wasn’t my future, it was much worse than that. The teacher of my young daughter had called me in to tell me that in her opinion my kid was not engaging like the other kids and that my girl was a potential problem and should be put immediately into a class for slow kids so she could learn the stuff which was boring her creative spirit to tears. Something inside me felt like it was going to burst open, like a flood-gate kept shut for far too many years was at full stretch. I wasn’t sure if I could hold it long enough to prevent collateral damage, but something told me that I didn’t have to hold on anymore. The teacher had just delivered a kind of verdict-like affirmation, which made escape unavoidable. Her words were the same dull mantra of “fit in, follow, don’t shine” I had heard forever and in that instant I decided not to listen to it anymore. Instead I plunged into determined action in a direction of my own single voice. “Staying was no where” any longer. This was the moment that turned everything around in my life; it was the moment when we actively chose another way of living and making the apparently impossible possible. An old and tired “no” inside me, gave way to a resounding “yes” and a path to follow. The life-long yearning inside me for more life, more colour, more meaning, rejoiced at that moment and it felt like a channel had finally opened up for us to move forward. Almost like the seas parted and we stepped out. None of this would have happened if I hadn’t first made the decision and commitment to be this change. And of course the change on the outside all started with listening to the inside. I’m Vanessa Jane Smith, from New Zealand with a background in communications and organisational development. I’ve lived and worked in Mexico, Spain and the Netherlands over the last 20 years. I focus my attentions on bringing a new way of working into the field of culture change within organisations. 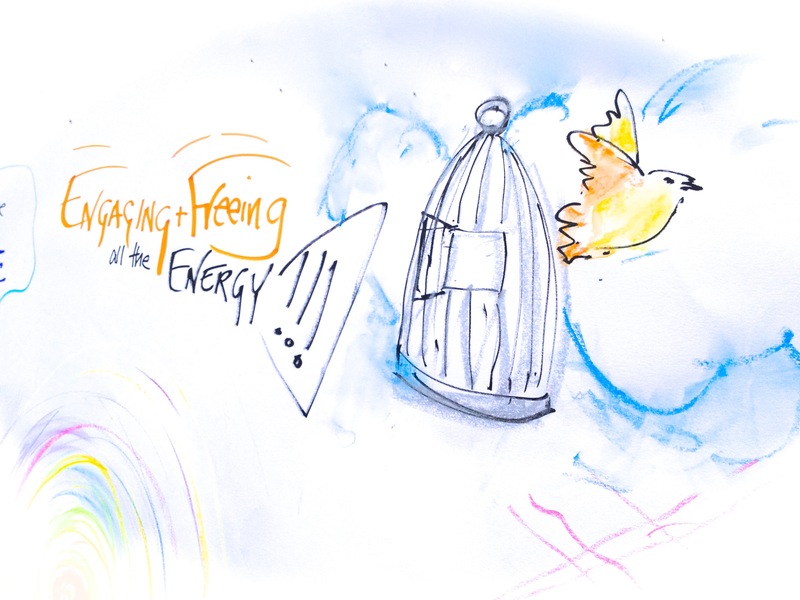 I have developed a collection of creative tools to support that change with group and individuals. But here’s the point of it all. The change starts with us, with the human beings at the heart of any organisation. And this change is powerfully harnessed when we really utilise our hugely powerful human capacities to open up and to listen deeper and wider, to step outside of our comfort zones and allow ourselves to break our own rules and play and be curious and doubt and not know always about outcomes. This is a call back to our own infinitely creative and child-like natures where presence and connection are our means to an end.